James Sterling Lavery was the son of William James Lavery and Ellen Lavery, Cookstown, County Tyrone. 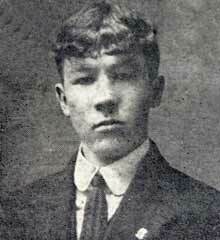 James was born about 1890 in Cookstown. After leaving school James served his apprenticeship in the offices of Gunnings Factory. James immigrated to Canada where he remained for two years before returning home.James was married to Edith Lavery. James Sterling Lavery joined the army in Cookstown and trained in Omagh. Soon after the outbreak of hostilities he was sent to Dover, from where he went to France in one of the earliest drafts. 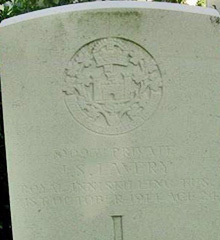 Private James Sterling Lavery was killed in action on the 21st October 1914. He was 24 years old. Grave Ref: VIII. O. 3.